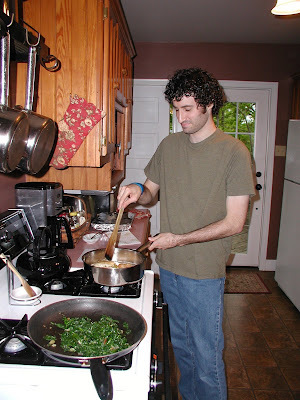 Eric was slaving away in the kitchen on Mother's Day making dinner for me. Rick (handsome hubby), Eric, and I loved it. I would definitely recommend this dish and have added it to my "internet" cookbook. You can find this recipe for Sauteed Chicken with Olives, Capers and Roasted Lemons here. Eric even cleaned up the kitchen. I could get used to this! My daughter Amber made me the cutest embroidered picture for Mother's Day which I will share as soon as I decide where I'm hanging it. I can't decide on the dining room or the bedroom. The day I found your blog, I saw that you published a painting book. Well, for it is not available in Germany I had to order it in the United States. And today, weeks ago I finally receives it. And wow, "Chsarming Village Scenes you can Paint" is so swell. In 10 days I will have an operation on my foot done. And then I will have to stay 3 weeks on the couch, not allowed to walk. I will read and paint. And I hope I will learn a lot by studying your book. What a good son! Glad you liked the dish he made, it sounds really yummy! Yummy, sounds good. My wife and I are vegetarians, so we had smoked salmon with creme cheese and capers. That sounds and looks wonderful! I love lemon and chicken. I am off to print the recipe. Did you teach your son to cook? Just wondered - a guy that cooks is one in a million! You lucky Mom!! Cannot wait to see the embroidery picture-- I have not done any lately but enjoy seeing them as a lot of work goes into them! Catherine, thank you for the follow up on the Capers, and also when I get the photo of me on the Harley from my better half I will get it posted, but back to the Capers. My wife and I went on a river cruise with some friends of ours to Germany last year, and it was on the Rhine River. If I remember correctly, there were 3 mornings on the cruise out of the 10 we were on the ship, where they served Smoked Slamon with Creme cheese and Capers, and to top it off, "Champaigne!" So good. So naturally when we returned to the states, we have this marvelous entre when we can.